Rosh HaShanah | Jewish New Year | Etz Hayim—"Tree of Life"
Shanah Tovah, Happy New Year. One of the special features of the Rosh HaShanah prayer services is the sounding of the shofar (the ram’s horn). The shofar, first heard at Sinai is heard again as a sign of the coming redemption. Rosh HaShanah is a time for remembering God’s faithfulness to Israel through history. That is why Rosh HaShanah is also called Yom HaZikaron (Lev. 23:24). Yom Hazikaron is a time for personal and communal reflection: How did I live the past year in faithfulness and justice? On Yom HaZikaron the liturgy remembers the faithfulness of the patriarch Abraham who offered his only son, Isaac, to God in faithful obedience (Gen. 22). As the result of his readiness to sacrifice Isaac, God caused a ram to appear and be killed instead. According to Jewish tradition, this sacrifice is believed to have occurred on the 1st of Tishri. The ram’s horn is linked to the shofar and in the Rosh HaShanah service hints at Isaac’s binding (Talmud, Rosh HaShanah 16a). Throughout the previous month (the month of Elul) the people have been in penitential mode—rather like the Christian Lenten preparation for Easter. Rosh HaShanah begins a time of anticipation of rebirth and renewal as the Jewish people enter into “The Days of Awe.” These days of awe are Ten Days of Repentance—ten days of self examination and commitment to a change of habits. The Days of Awe are days of teshuvah—a Hebrew word that means "return". These ten days come to a climax with the holiest day of the whole year for Jews, Yom Kippur, “The Day of Atonement.” During the Days of Awe Jews seek forgiveness from God as they reflect upon their wrongs committed in the past year and, at the same time, people visit or call one another to seek forgiveness for their human failures and omissions in relation to each other. Rosh HaShanah begins a period of personal examination of conscience and of focusing on change in our attitudes and behavior. During the Days of Awe (which begin on Rosh Hashanah) tradition has imaged God as in the judgment seat. Ancient Jewish tradition from Babylon spoke of angels as prosecutors and defenders in a heavenly courtroom. A more realistic later and contemporary notion is that of the God of judgment as the internal conscience. God calls upon us symbolically during this season [but in reality at all times] to be the best morally, spiritually and ethically that we can be—which means, that we must always be open to change and the presence of the divine in our lives. Rosh HaShanah traditionally honors the Creation of the World [Passover marks the creation of Israel]. The rabbi’s noted that the Hebrew word bereshit ( , in/with beginning), which is the very first word in the Torah and begins the account of the creation becomes, when one rearranges the letters, the 1st of Tishri—the date on which the New Year, Rosh HaShanah, falls—Tishri One ( ). 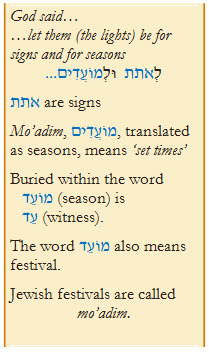 The festival of Rosh HaShanah, therefore, reflects or is witness to the creation. The festival is one of the ‘signs’ that ‘witness’ to ‘fixed times’ in Time where we are drawn out of the reality of everyday experience and into the ‘reality’ of the infinite. The Talmud not only draws out the importance of Rosh HaShanah as the birthday of the world but links the feast to important dates in the ‘history’ of the Jewish people. Abraham’s offering of Isaac at Mt Moriah [the Aqedah (binding)] occurred on Rosh HaShanah. The prayer services on Rosh HaShanah include, besides the regular daily Amidah prayers, prayers that focus on repentance and redemption: who shall live and who shall die, who will be written in the Book of Life. The Rosh HaShanah additional prayer service, called mussaf (addition), inserts three special blessings/berakhot into the Amidah prayers related to the major themes of Rosh Hashanah. These prayers anticipate a future day when all people will acknowledge and accept the kingship of God. The Rosh HaShanah mussaf service acknowledges, “Therefore, we bend the knee and reverently bow before the King of kings, the Holy One, praised be God.” At this point, as part of the choreography of the service, it became customary to bow before God in a physical act of accepting God's kingship. 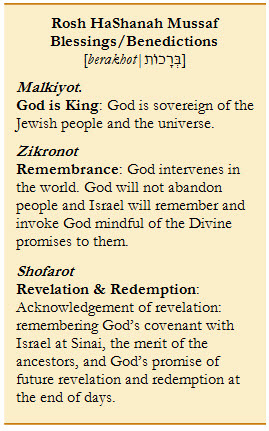 The Rosh HaShanah Mussaf prayer themes develop the notion of God’s kingship, God’s fidelity, providence, and revelation. The Mishnah indicates that it has been the practice to sound the shofar at the conclusion of each section since ancient times (Rosh HaShanah 4:5-6). Standing in their places, they read from the scroll of the Teaching of the LORD their God for one-fourth of the day, and for another one-fourth they confessed and prostrated themselves before the LORD their God. Since ancient times the distinctive notes of the shofar have been understood as a call to repentance. During the 30 days of Elul and through the Ten Days of Repentance the sound of the shofar proclaims both God’s sovereignty and a call to repentance. The Talmud [Tractate Rosh HaShanah] relates the manner in which the shofar should be sounded. The basic pattern is a combination of the sounds produced by the shofar—Tekiah, Teruah, Shevarim. The tekiah is a continuous sound that stops abruptly: a sound of attention, a call to gather. Teruah on the other hand is a series of broken staccato sounds rather like sobbing, while shevarim is a series of three shorter wailing notes. Put together in various sequences the shofar notes produce a sense of the trembling, signing and wailing with which one stands before God’s judgment. “You who are asleep, wake up! Search your deeds and repent. Look into your souls, you who indulge all year in trifles. The challah (bread) used at Rosh HaShanah is usually a round loaf rather than the usual oval or rectangular loaves used on Shabbat or other festive meals. The round shape is symbolic reminder of the sovereignty of God—a crown, and also a reminder that God awards “crowns” to the righteous. During Rosh HaShanah it is customary to greet one another with a blessing for a Good New Year and a good inscription in the Book of Life. The greeting "and a sweet one" reflects the New Year custom of eating apples dipped in honey. Shanah tovah umetukah ... Happy New Year and a sweet one! Leshanah tovah umetukah tikateivu ... May you be inscribed for a sweet and good year. Strassfield, M., The Jewish Holidays: A Guide and Commentary (New York: HarperCollins, 1985).